Do your gutters look this? If so, let us come out and clean them out for you before you end up with very serious damage, by having a pile of debris in your gutters you will have a lot of moisture, rainwater flow will be obstructed and overflow behind your gutters and damage your roof and more than likely the inside of your house. The frequency with which you should clean out gutters depends on your house. Determining factors include proximity of trees to the roof line, the type of trees, and the slope of the roof. Low sloped roofs can require more frequent cleaning. For houses with trees within ten feet of the roof line, gutters will need to be cleaned out twice a year at a minimum. 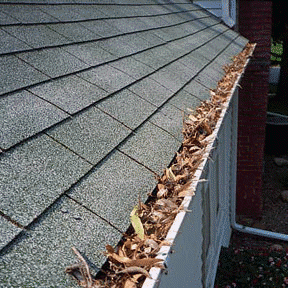 In some cases gutters may need to be cleaned out a couple times in fall alone. One myth about gutters is that houses with no trees don't need to be cleaned. Gutter cleaning may still be required, especially on houses with asphalt shingles. Over time these shingles lose their granules and these granules make their way into the gutters, just look at the picture to the right. Overflowing Water -If water can't flow through your gutters, the excess will pour right over the sides and directly against your foundation. You risk damage to your garden plants and shrubs, porches, patios, and siding. Plus you will have soil erosion near the foundation, and could find yourself with a flooded house, leaky ceilings and walls, or massive rot to the structure of your house. Fascia Rotting -The fascia, the board against which your gutters sit, can begin to rot with continued exposure to sitting moisture, causing a multitude of problems for your gutters, roof, and the structure of your home. 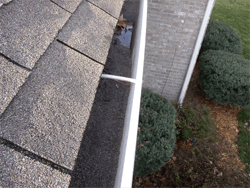 Gutter Damage -Water and soaked leaves can be very weighty and may actually pull the gutter system away from your house, or cause other costly damage to your gutters. Mosquitoes – Yes, those pesky bugs will lay their eggs right in the stagnant gutter pools that form when your downspouts are clogged. Hassel-cleaning gutters can be very dirty and messy. Also it can be physically demanding. ETC. - In addition, excessive water can damage sidewalks, driveways, interior floors and in extreme cases it could even destroy the home. Are you ready to have us clean your gutters? If so, just give us a call or contact us right away to get started.